About a year ago my long term subscription to Scale Aircraft Modelling ran out and I choose not to renew it. I wasn't enjoying the new make-over and the magazine no longer was in line with my tastes. However, when I saw that the July 2010 issue would be another Canada Day Special, I forked over my $11.99 (ouch) and decided to see if things were any better. My big complaint with the new SAM was awful proof reading and articles with few words and little meat. Sure most of the builds were nice, but the articles didn't teach me anything. Sadly I have to report little has changed. Things start off poorly on the cover. There is a focus on the Special Hobby Baltimore which they deem "Impressive!" What would be really impressive was if there was anything on a Special Hobby Baltimore, or indeed if Special Hobby actually made a 1/48 Baltimore. Of course they are talking about the new Maryland...but whatever...details don't matter right? Also what is a CF-5B? You see it used all the time, but there is officially no such thing. The Canadair built F-5s operated by the CAF were designated CF-116 and named CF-5A for the single seat version and designated CF-116D and named CF-5D for the two seater. Again, why would we care about details in a modelling magazine? The Title Page states: "The CF-5 was a licence-built Tiger II by Canadair..." Huh? 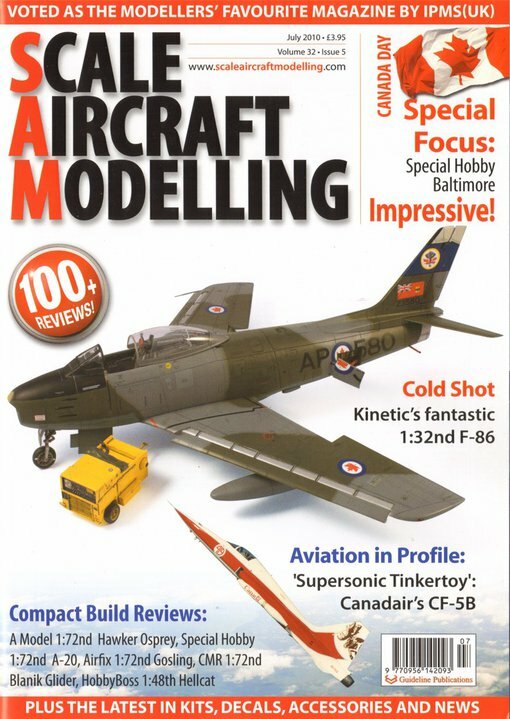 Tiger II...um, no it was a licensed build F-5A, not F-5E... (It's ok, later in the magazine in the Next Issue section a build of the F-5E is titled Freedom Fighter...) Oh and the editorial mentions that they are grouping a book review on the Bf-109 along with some conversions to make it easier on the modeler. That sounds like a decent idea, other then there is no Bf-109 book review. After all that, I was actually scared to read the CF-5 article, but guess what? It was decent. No major gaffs and even the designations were correct. The photo captions have some issues, like reference to the natural metal finish of the CF-5D (actually it was aluminum lacquer, which is correctly noted in the profiles), and embarrassingly a caption makes mention to note the bolt on refueling probe on an aircraft that isn't carrying it. Some nice looking drawings and plans are included for the CF-5D. The Kinetic 1/32 Sabre 6 article is ok. However, the builder clearly has little clue about Sabre wings. In the "'6-3' or not '6-3'" section he mentions how it is an important question with Sabres, and then goes on to mention that "a large proportion of them...seem to have been retro fitted with this wing at a later stage in their flying career." While this is true of RAF Sabres, it is not the case with RCAF Sabres. In fact the only RCAF Sabres ever to be retrofitted with different wings may be the few early Sabre 6s built with the '6-3' hard wing. No other RCAF Sabres ever carried more the one wing during their military carrier. Also, just which brand of interior green did the builder use for the wheel wells? Lifecolor or White Ensign? (He mentions both.) Nice model though. And I don't even want to get into their asinine book review page. Why waste space on the publishers puffery? Just dumb. A review is a review, not rehashed marketing fodder. Not all is terrible. I enjoyed the article on building the 1/72 MPM A-20 and even picked up a nice tip on making your own decals and the review of the 1/72 Airfix Widegon conveyed just how much fun these old kits can be. Sadly, nothing in this issues made me regret my decision to stop buying the magazine. The cover price is out of sight, and the content is thin. The editing is terrible and many details are overlooked. But hey, the pictures are nice...maybe some think that is worth $12. Not me.